Known as the Ersatz Weissenburg, construction number 186. Cost of 45 million marks. König, Kronprinz and Grosser Kurfürst. All Action times in CET.Third ship in the line behind König and Grosser Kurfürst.At 17:46 Scheer gave the Order for fire to be opened. 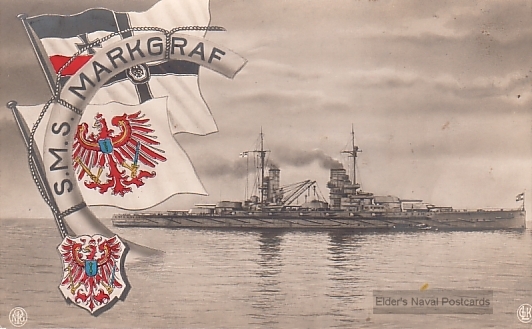 König, Grosse Kurfürst and Markgraf were first to get into range and engaged Princess Royal and Tiger at 21,000 yards. At 18:25 Tiger was out of range.Markgraf had been hit at 18:10 and was targeted by a torpedo fired by Moresby at 8,000 yards. The 18:10 shell hit between side armour plates and about 400 tons of water was taken on. After 19:20, after Defence had been dealt with at close range by König (Markgraf gunners claim a hit as well), fire was switched to the Princess Royal on which she scored two hits, the first going through the amour on X barbette and putting the turret out of action, the second penetrated th e6" belt armour and caused the death of 11 and the severe wounding of 31. Markgraf&apos;s secondary guns followed the general assault on Warrior which was trying to avoid the same fate as her sister ship, Defence. At 19:32 she came under heavy fire from the deploying British battle line, from Orion who fired four salvoes of APC and hit with the last putting the No.6 casemate gun out of action. Then at 18:44 Markgraf had to reduce speed to around 17-18 kts as a shell had bent her proeller shaft. At 20:00 the 2nd LCS launched an attack which was held off with 15 cm fire but Agincourt was targeting her with 12" fire hitting at 20:14. The shell failed to penetrate the 8" armour. At the 20:10 Turn Away, Markgraf turned early because of her reduced speed, forcing Grosse Kurfürst to break formation. In the early part of the night action, the line was attacked by British LC and destryoer forces at 21:10. Markgraf took on Calliope and hit her five times Markgraf had fired 254 main battery and a further 214 from her 15 cm casemate guns. 3 Bergmann steam turbines driving three shafts with three bladed propellers. Three oil fired and twelve coal fired boilers provided steam Rated at 43,300 shp.